We feature many types of desserts for different occasions and different styles. Check out our gallery to see all of our creations! We have many different specials to offer our customers! Please view our specials to see our current offers. We offer cakes, cupcakes, pastries, and more for many different events! Place your order now by visiting our order forms page. Welcome to Cakes By Karen! 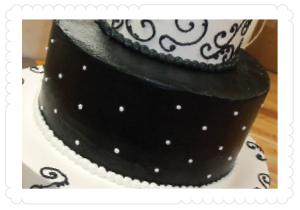 Cakes By Karen specializes in pastries such as muffins, scones, and French desserts; custom cakes for weddings, bridal showers, baby showers, children's birthdays, and other special occasions; gourmet cupcakes; and more! Our team can create specialized desserts such as photos on cookies and cakes and we also enjoy celebrating national holidays, such as Paczki Day, making our famous paczki. Cakes By Karen can also cater to special dietary needs. We are located right in downtown Highland, Indiana and service the surrounding areas. 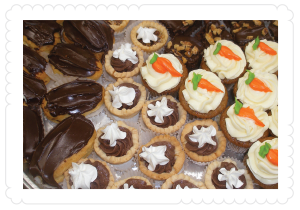 Stop by to check out our delicious treats and find out how we can make your events special! Thank you for a delicious cake for our son's christening. As usual, the cake tasted amazing. Everyone loved the raspberry mousse filling. The mini desserts were a hit as well! The cake looked so nice, I didn't want to cut it! What a stunning cake you created for Caroline and Tyler's wedding day! Gorgeous and delicious! Thanks for helping to keep the day running smoothly! Hope to work with you again soon! I've had quite a few of your cakes for various events such as weddings, showers, birthdays and even anniversaries. I think it's safe to say that our family loves you guys! Each and every cake was so delicious and I now always ask where the desserts are from hoping that they are from Cakes By Karen! We just wanted to say thank you for doing such a wonderful job on our wedding cake. It was so beautiful and of course was delicious. So delicious that we ordered a birthday cake from there in the same flavor 2 weeks later! Thanks again! 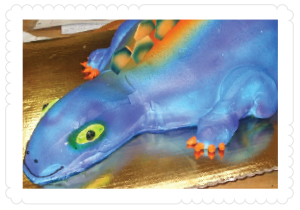 Your staff was great and the cake was not only beautiful...it was delicious! Thanks for making our day special.